Consider the moment when the barber holds up the mirror so you can examine the cut of your newly trimmed neckline. Have you ever been slightly surprised by the realisation that, firstly, the back of your head actually exists and, secondly, how unfamiliar you are with what it looks like? Interaction testing (Mocking) is somewhat similar. You’ve probably been testing this stuff for years but have you ever really peered round to examine the far side of a class and how it interacts with its collaborators? When you start to practice TDD you often discover the need for stubs as you try to isolate the functionality you’re trying to test (as discussed in the previous article – here). However stubs alone leave the Test First developer with a problem: Some classes simply do not expose a change in state, making them hard to test using state based assertions as there is nothing to assert on. Most developers will solve this problem by adding some basic functionality to a stub object so as to expose evidence of the ‘interactions’ of the object under test to make up for the lack of a state change. For example, if we had an object with a callback we might provide a stubbed implementation in the test that has a a boolean ‘callbackMade’ which is asserted on in the test. The development of such active stubs is the first step on the road to Interaction Testing. But Interaction testing is much more than stubs with a little functionality added; it’s a change in the testing paradigm. Testing becomes about the behaviour of objects rather than a function of the system. 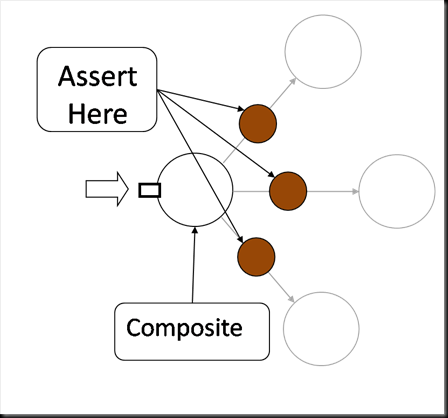 The tested landscape morphs to include state and interactions so that no matter how an object decides to behave we can make critical assertions. This encourages the testing of objects with well defined responsibilities, rather than functionality of the system. However to see how Interaction Testing changes the way we test, first we must understand why we need Interaction testing at all. Unit testing becomes about the behaviour of objects rather than the function of the system. Consider an extension to the call stack model, presented in the last article (here). The figure below evolves this model by adding branching of the call stack, this being a better approximation of reality. Small branches, such as the one highlighted at the top, are naturally encapsulated making them easy to test with simple, state based tests. However classes whose primary concern is to aide the forwarding of the call stack (rather than exposing a change in state) present a tougher problem. 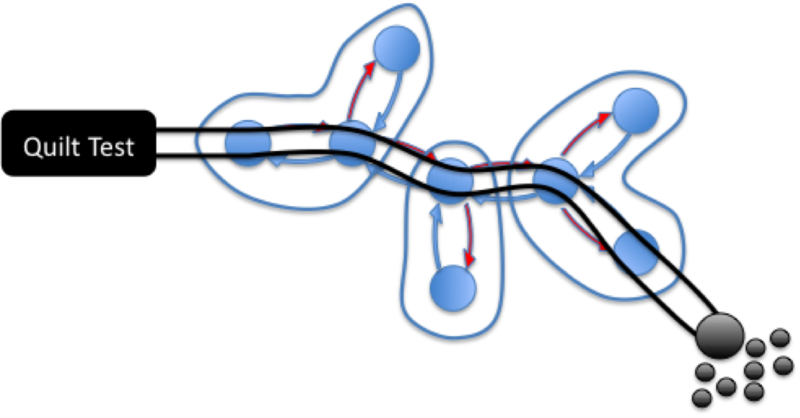 For example the lower circled interaction in the figure below. Such objects are defined solely by how they interact with collaborating (composed) objects. Examples of such types of classes include Proxies, Marshallers and Composites, to name but a few, none of which change state as a result of their behaviour. Lets consider the example of a composite object which forwards invocations to a set of delegates that share the same interface. To test such a Composite Object assertions should be made on the calls it makes to the objects being composed (all the red circles on the figure), so that we can ensure that this contract, of forwarding calls, is honoured. This could be done with a stub that tracks invocations. The success of the test is then based on the stub’s invocation counter being incremented by each forwarded call the composite makes. This moves us towards a different paradigm; Interaction Testing, where tests assert how an object interacts with its collaborators rather than how it changes state. 1) A succinct tool that allows them to demarcate the area under test with stubs. 2) A method for asserting on the interactions that a class makes with its collaborators when such assertions are important to the test. When we practice TDD with mocking frameworks both of these tools have a significant affect on the process we follow. Firstly Mockist developers only need to concentrate on developing one class at a time. Classes are developed in isolation with mocked interfaces providing detail of the roles collaborators must provide. This in turn leads to a rapid loop – writing a test, writing the implementation – teasing out collaborating roles as mocks. Once the class is completed focus is turned to one of the previously defined collaborating roles and the cycle is repeated. This encourages the prescription of specific roles that collaborators must perform rather than simply defining entities. The process is akin to Design by Contract and some refer to this as Need Driven Development. Martin is alluding to the fact that Interaction Testing increases the length of metaphorical rope available for a team to collectively hang themselves. This is often reported as test code that increases the cost of maintenance, making refactoring harder as changes in the internal workings of a class, in a way that affects the interaction with its collaborators, will cause tests to break. This is demonstrated in the figure below. The retort to this is simple. If the interaction is truely significant then it should be asserted on. Why should a change in state on the front interface be more important than a change in interaction on the rear one? In addition the increased coupling is rarely the root cause of the horror stories associated with mock driven development. The reported symptom of excessive coupling between test and source can more often be attributed to a lack of experience in writing mock-based tests than a problem that is intrinsic to the method. The telltale sign of such issues are conditions under test being obfuscated by mocked interactions that have no relevance, which in turn arises from a poor use of stubbing. There are many causes for problems with Mock driven development; under use of stubs and attempting to retrofit mocking into code that was not designed to facilitate it being the most frequent that I see. The key point however is that, whilst mocks do increase the coupling between test and source, the increase is negligible if the mocks and the source they test is well designed. Mocking brings with it a change in process and a change in thinking. 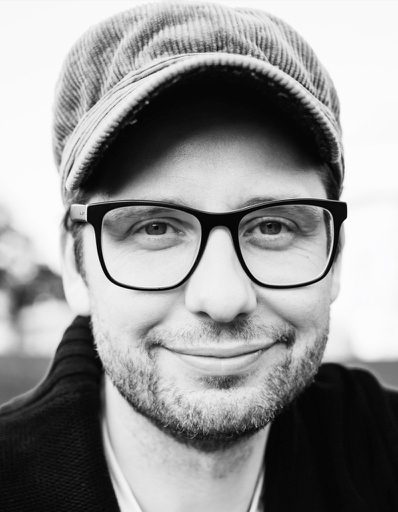 This is not for everyone, and it is certainly not the simplest way to develop, but this change in thought process is fundamental and, if you are serious about your testing, the benefits may be irrefutable. I’m planning a short set of articles on testing, summarising my thoughts from the slides presented at RefTest (here). This first one looks at the traditional split between unit tests, in which tests are generally isolated, and functional tests, which exercise an entire call stack. If an application is built without the use of stubs to demarcate the units under test, it will inevitably suffer from overlap with multiple tests exercising the same source code. The overlapping of different areas of the call stack means such tests cannot provide accurate feedback on failures when they occur: A single bug will manifest itself as a multitude of failures in the overlapping tests. 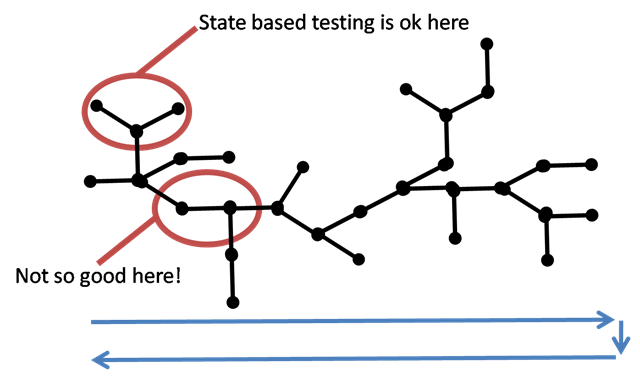 This problem of overlapping tests can be solved by isolating the area under test with stubbed interfaces that provide fixed behaviour. This adds isolation such that a single object, or group of collaborators, can be tested in independently. Thus the call stack, in this “Stub n’ State” approach, is broken into sections that are tested individually against fixed-response stubbed interfaces. 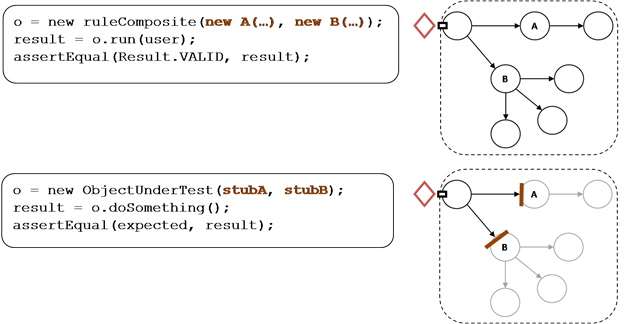 A more realistic example is provided below showing an object graph being exercised by regular state based testing (upper diagram). 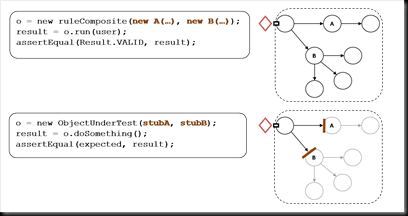 The lower diagram shows the Stub n’ State approach where stubs the object graph is chopped up with stubbed interfaces to provide isolation of the functionality under test. In the first code segment the object under test is initialised with real versions of its collaborators passed into the constructor. However in the second example we pass in stubbed versions. This fixes the behavioural interfaces X-A and X-B isolating the functionality in X. However the Stub n’ State has a problem. Isolating areas under test opens the code base up to the risk that individual sections may diverge from one another. 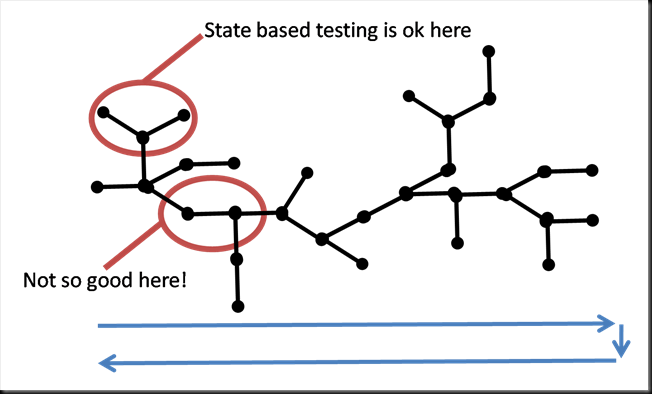 To make sure all the dots tie up, broad state based tests are used to surround the whole call stack. Such tests only exercise a single path through the code base and provide poor feedback on the cause of failures, but the complement of both types of test covers all bases. Thus we find three types of tests, which shall be denoted Isolated Test, Call Stack Test and Acceptance Test. A Call Stack Test is a state based test that tests a class and all dependents in the object graph beneath it. An Acceptance Test is a special type of Call Stack test that tests the application end to end test (e.g. UI to database and back) in a way that simulates the action of a real user. An Acceptance Test always starts with the input to the system and always ends by asserting the expected output of the system. An Isolated Test tests a class or functional group in isolation, either because the code under test is naturally isolated or stubbed interfaces have been used to provide isolation (the most common approach). Call Stack Tests which exercise the entire stack, from the test down, are insufficient on their own. Suites of such tests are slow to run and provide poor feedback due to overlapping test coverage. Subbed Unit tests (Isolated Tests) make full test coverage possible, with accurate feedback on failures, but do not prove that the system will run as a whole. A good approach to avoid overlapping of test cases is to only utilise call stack tests that are Acceptance Tests (i.e. they exercise the system from system input to system output). By forcing the Call Stack tests to the outer layer the temptation to create overlapping tests at different sub-layers is removed. In summary, unit testing involves testing a small unit of code in isolation. To unit test properly you must isolate areas of the call stack and stubbing is the tool used to do this. Call stack tests are required to ensure all the ‘dots’ line up but are best limited to tests of the system as a whole.